Examples of this are all around us, regardless of what industry you work in. Software engineers use chunks of pre-written code to speed up development of new systems, general contractors use pre-formed concrete sections to speed new building construction, and the automobile industry uses pre-built modular components, like wiring harnesses and dashboards, sourced from outside vendors, in the assembly of their vehicles. The argument for pre-made, modular and plug-n-play is easy to make, and the trend towards these systems is increasing. In the midst of such a revolution, is there still a place for hand-crafted, site built products? In the HVAC industry, at least, the answer is a resounding "yes". The construction industry has traditionally been very hands on: Ductwork is often hand built by sheetmetal workers, piping is welded and soldered by hand, wires pulled by hand, drywall, painting and more are all done by hand. Like a small army, construction workers surround a building site and put their blood, sweat and tears into building something from nothing, all with their hands. Yet, modularization has made its way into the industry. At my firm, MonMan, we do a lot of work in the HVAC industry, and have seen the modular trend make inroads in recent years. While much of the peripheral systems are still built by hand, the heart of an HVAC system, the Air Handlers, are often chosen from off-the-shelf, modular, one size fits all units. In the data center world, modularity isn't just the latest and greatest, it's often the key to lowering capital expenditures while creating system scalability. But in the gritty world of HVAC, we don't always have a large, pristine data center as our blank canvas. Most of the buildings in the U.S. are existing buildings, and have enormous challenges associated with them. In many of these sites, modular units just won't work. But in all of these sites, modular air handlers cannot provide the efficiency and reliability required of today's audacious energy savings goals. Modular Air Handling Units simply do not offer the customization options a "stick built" unit offers. And there's more: modular, pre-fabbed units cannot be built in-place, and need large access spaces for them to be rigged into an existing space. And that is the key: When your access path includes a 3 foot door, you must build on site! Sure, there are other options like purchasing a modular unit, cutting, sawing and chopping it up, then riveting it back together. But make sure you bring several cases of caulk with you, because it will never be the tight, efficient unit it was at the factory. For several years now, I've been a fan of SiteBilt units by Air Enterprises. 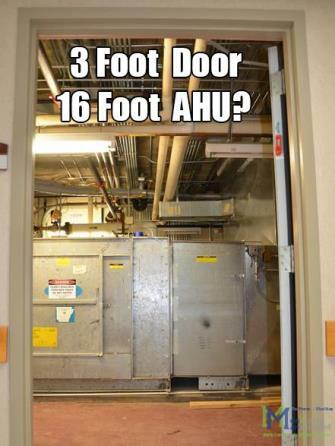 It's more than a "site built" air handler, it's a complete process of replacing old, hard-to-reach AHUs with new units that carry a 40 year warranty. All of the components, from the unit base and panels, to the coils and fans, are sized to fit through the "choke point"-the smallest opening through which the units will have to pass. Choke points in existing buildings are often challenges like: small elevators, ladders, stairwells and even 3 foot doorways. They are assembled on site, by a trained team, using interlocking flanges, rivets and butyl sealant. The units end up so well-made and tight, there is not only a 40 year warranty on the casing, but a 40 year air leakage guarantee (of 0.5% or less). 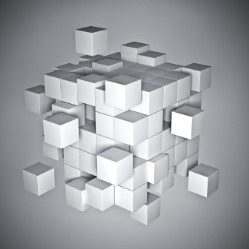 One advantage modularity has, besides time savings, is a perceived cost reduction. One must assume that a major automative company has run the numbers and knows that buying that pre-wired dashboard from a third party vendor saves them $x per unit, and $X per year. But what about our unsung hero, the air handler? Can a customized, site built air handler actually be cheaper than an off-the-shelf commodity unit? Yes, most definitely! Tearing a wall out to replace an air handler isn't creative; it's counterproductive. There's a better way. Hard to reach air handlers often require expensive rigging operations and site renovations in order to replace. If you are "lucky" enough to have an outside wall near your AHU, you can tear out part of the wall, replace the unit, and patch up the wall. If your AHU is near the roof, you can rent an expensive crane, block off traffic, and lift a new AHU to the roof. But if those options don't appeal to you, maybe a SiteBilt unit will. They are custom designed to fit any application and to fit into any space. They carry a 40 year casing warranty and a 40 year low-leakage guarantee. They accomplish an efficient operation and higher quality level as a "site built" unit than other "factory built" air handlers can only dream of. There's something refreshing about a product and service that is custom-tailored to your particular needs, is much more efficient than what you currently have, and, in the end, costs less than other options. In today's fast-paced world, it's nice to know there's still room for hand made quality.